The asymmetric pattern tyre from Apollo is an ideal combination of comfort, grip and durability. The Amazer 3G Maxx is one of the best selling tyres as an aftermarket fitment and an excellent upgrade to many. The wide contact patch of the tread with pronounced shoulder provides better grip and reasonably good wet and dry performance. It gets rigid sidewalls that offer better steering feel and confidence while cornering at high speeds. The long route drives are quiet due to optimized sipe density and stable tread noise performance. The 3G Maxx's asymmetric tread and robust sidewalls make cornering easy and predictable. The wide range of rim sizes make it available for nearly every passenger car segment. 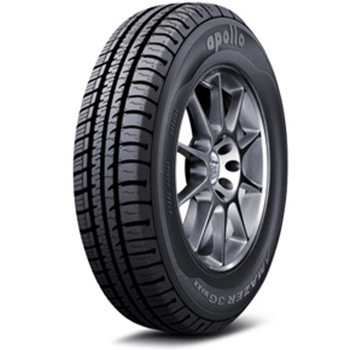 The Apollo Amazer 3G Maxx is endowed with 5 year warranty from Apollo Tyres. The Amazer 3G Maxx is a tyre with reliable and practical approach in terms of day to day use. Visually it appears no less than a premium tyre with its even finish and soft / light feel. Its asymmetric tread pattern design helps in excellent performance under varied conditions. With its slightly softer compound and stiff sidewalls, 3G Maxx supplies supple ride to the occupants. The optimized sipe density at the tread ensures quiet ride at high speeds. The tyre grips the surface well in motion as well as at the time of braking due to asymmetric tread design. The progressive groove design benefits in better water channelling and prevents hydroplaning. It features superior directional stability due to inter connected shoulder blocks of the tyre. It secures impressive performance on dry road surfaces and under damp / wet conditions. The tubeless nature of tyre promotes safety against frequent punctures.